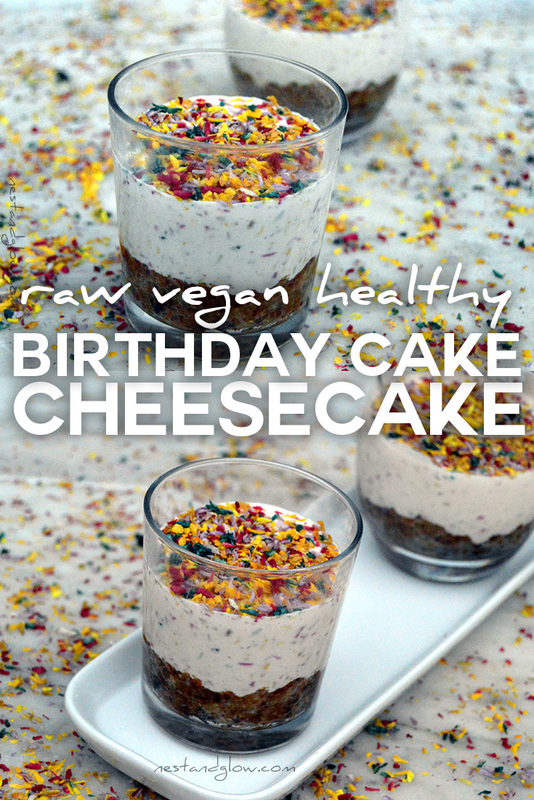 Try this easy and healthy recipe for birthday cake raw vegan cheesecake. Suitable for gluten free, dairy free, refined sugar free, vegan, raw and plant based diets. 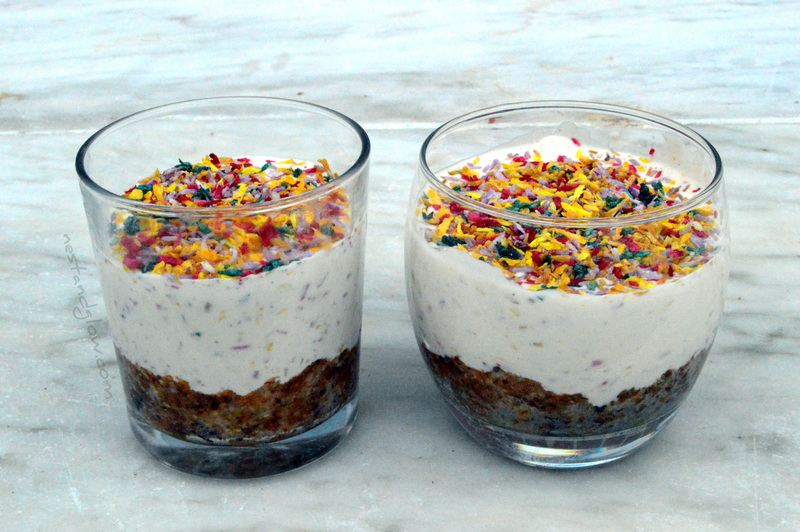 It uses our own recipe for natural sprinkles that are made from just fruit / veg and dried coconut. 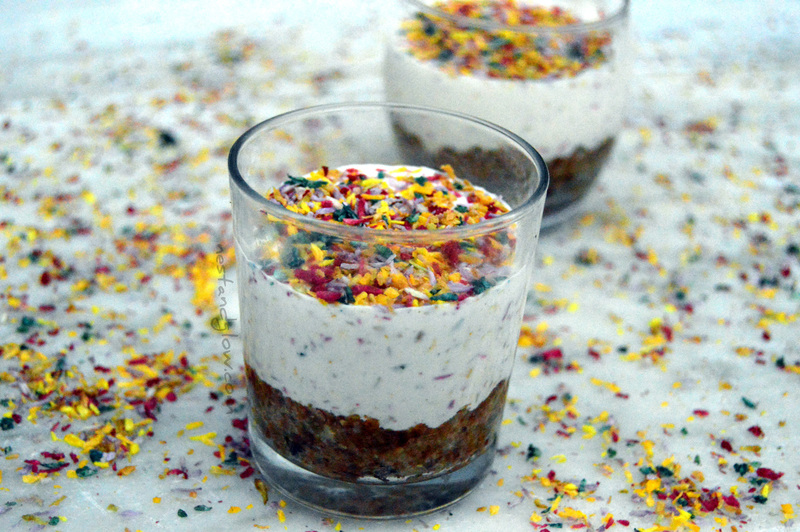 The cheesecake on its own is a delicious lemon-vanilla flavour but the sprinkles make it look very appealing. Some call this a “dreamcake” as it contains no cheese and has cashews instead. I stick with cheesecake as when people try it they don’t even notice that it’s dairy free – they just notice how good it tastes. Blend together all of the base ingredients until they are combined and stick together. Spread out the base into your individual jars or one big pan. Melt the coconut oil and then blend with all the other filling ingredients until smooth. Pour the filling over the bases and tilt to spread to the edges. Sprinkle on some more sprinkles! Put in the fridge for 30 mins to set. Store in the fridge and eat within a couple of days. High in fat and sugar but they are all raw unprocessed healthy fats and sugars. This cheesecake is bursting with nutrition and has no empty calories. I have to admit I’ve never eatten anything “birthday cake” flavour, but I came across lots of pretty cakes on instagram that were basically vanilla cakes covered in sprinkles and called birthday cake flavour. So hopefully I’m on the right track with this recipe. In this recipe you can swap out the maple suryp with any other sweetener to make it. I often use date syrup or zylital but any will work well. Hello, the cheesecake part is quite runny in this one. If you want to make a big one then double the amount of coconut oil. So 4 level tbsp and it will set. You may want to put it in the freezer for an hour and it will be firm enough to cut. I probably lowered the amount of oil in this one as I’m trying to limit the amount of oil.